This bundle includes seven lessons which make up Unit 4: Techniques of Differentiation. 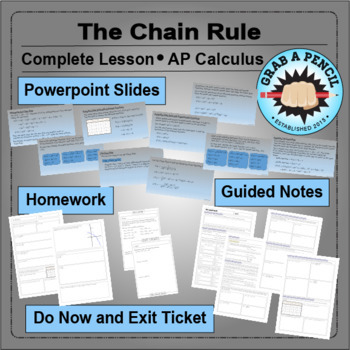 These lessons are appropriate for AP Calculus AB, AP Calculus BC, or college calculus.Each lesson includes a PowerPoint presentation along with guided notes, a Do Now, an Exit Ticket, and a homework assignment. 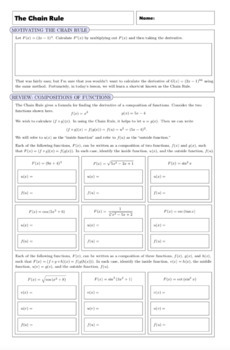 This lesson develops the rule for calculating the derivative of the composition of functions, otherwise known as the Chain Rule. Students first review how compositions of function work, then they practice using the Chain Rule. 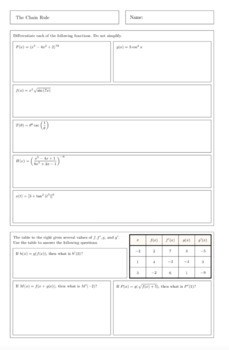 Derivatives that combine the Chain Rule with the Product Rule and the Quotient Rule are also examined. 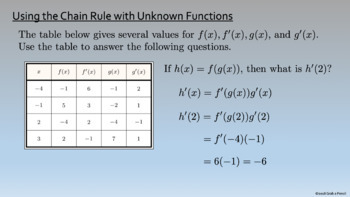 Finally, students learn to use the Chain Rule on "unknown" functions, given only a table of values. This lesson is appropriate for both AP Calculus AB and BC. Detailed answer keys are included.